Matthew first started to play occasionally for us in the summer of 2014 and took over as the Norwich Singers regular accompanist and deputy musical director in September 2014. Matthew began learning to play the organ in 2000 having lessons with Peter Stevenson. In 2006 he passed ABRSM grade 8 Organ, winning the Willden prize for that year. He studied A-levels at City College in Norwich, which included music and music technology. He went on to read music at the University of East Anglia, graduating with an honours degree in 2010. 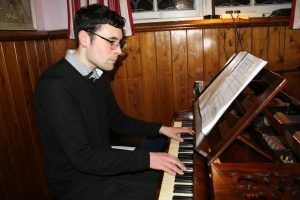 Matthew has completed a Diocesan organ scholarship, studying with Julian Haggett. He is the director of music at St Mary’s Wroxham and one of the organists at the recently opened Cromer Crematorium and he combines this with freelance work as a teacher, organist and accompanist. As well as accompanying the Norwich Singers he also plays for The Choir Worstead and Broadland Youth Choir. Matthew is currently the membership secretary and President of the Norfolk Organists Association.